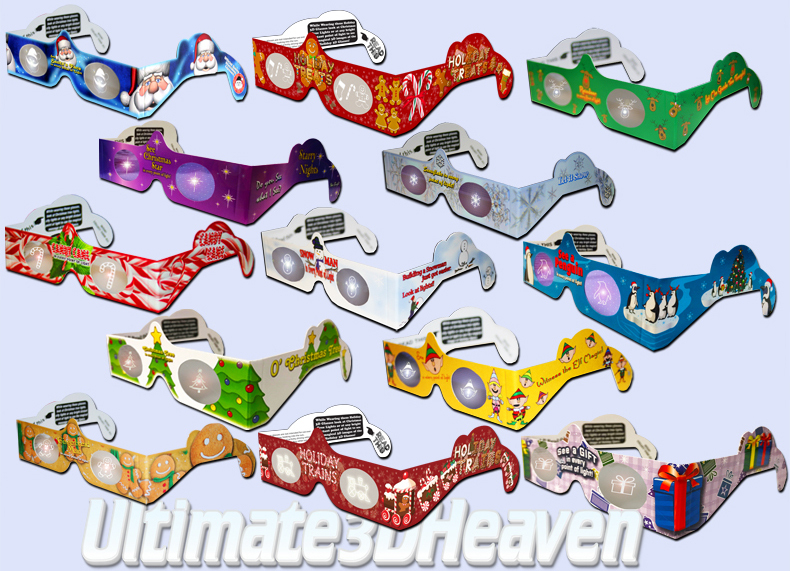 Holiday Specs - Family Fun Pack Mixed Bundle 13 Pack Including two new styles for 2017 only available through Ultimate3DHeaven "Holiday Treats" and "Holiday Trains" & all new for 2018 Christmas Tree & Gift Wrapped! Includes 39 Of Each Pair! Seeing is Believing! Holiday Specs™ instantly transform Christmas lights, fireworks, candles or any bright point of light into magical messages. Our holographic lenses bend the light creating magical illusions. Each glass is colorfully printed complete with easy to read directions. With more than 10 million sold at retail, people of all ages have witnessed this mysterious phenomenon all over the globe. 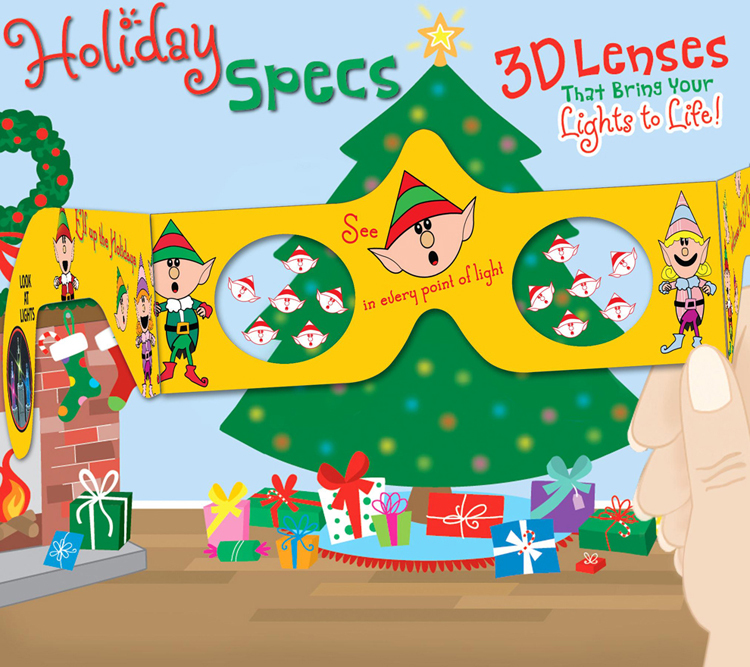 The Holiday Specs™ line includes Snowflake, Christmas Star, Fluttering Angel, Santa, Snowman, Reindeer, the brand new Elf glasses & many more! Holiday Specs™ amazing holographic glasses are great for party favors, greeting cards, teacher/student gifts, package decorations, holiday gifts, holiday light displays, corporate gift giving or fundraising. Be amazed this holiday season as our patented lenses transform ordinary holiday lights, city lights, street lights, and more into magical holiday images. It’s absolutely amazing! Our amazing mix of 10 holographic lenses bend light creating a magical images on each bright point of light, providing an optical experience like you’ve never seen before! These amazing paper glasses are perfect for gifts, stocking stuffers, holiday parties, teacher/student gifts, fundraising and more! Holiday fun for everyone!